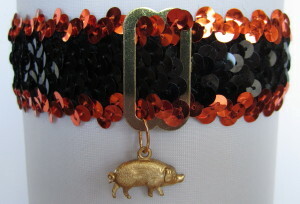 Biker Bands™ Motorcycle Garter & Hog Garter Official site by Custom Accessories Garters. Black Lace Biker Bands™ Garter with a SILVER Chain Mail Band -	Matching SILVER Metallic Sheer Bow - SILVER Ring with Black Pearl Eye - SILVER Motorcycle Charm. 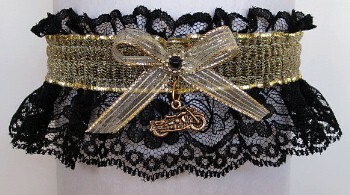 Black Lace Biker Bands™ Garter with a GOLD Chain Mail Band - Matching GOLD Metallic Sheer Bow - GOLD Ring with Black Pearl Eye - GOLD Motorcycle Charm. 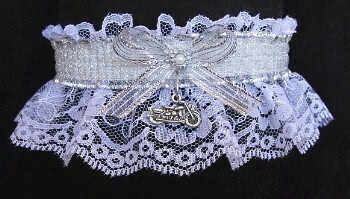 White Lace Biker Bands™ Garter with a SILVER Chain Mail Band -	Matching SILVER Metallic Sheer Bow - SILVER Ring with White Pearl Eye - SILVER Motorcycle Charm. White Lace Biker Bands™ Garter with a GOLD Chain Mail Band -	Matching GOLD Metallic Sheer Bow - GOLD Ring with White Pearl Eye - GOLD Motorcycle Charm. Rebel WITH a Cause !! !